In other news, Al and I will be hosting the 2nd ever Strength Calisthenics Certification in NYC on March 2016! This is a one-day intensive workshop covering the Big 6 calisthenics exercises from Convict Conditioning: Squats, Push-ups, Pull-ups, Bridges, Inversions, and Leg Raises. We will go over proper technique for all these movements as well as how to break them down and teach them to your clients! 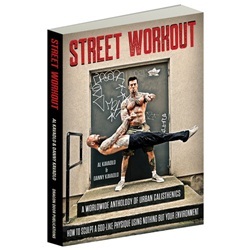 This certification is for trainers, athletes, and enthusiasts alike looking to step-up their bodyweight game and an opportunity to learn calisthenics from Grandmaster Al Kavadlo & me! Do you have what it takes to become a Calisthenics Ninja? 😉 Sign up now! Hope to see you at the next workshop! Peace, ❤ & Ninja Kicks! One day for sure. Would definitely attend one of these workshops. They sound pretty choice.